Hooray! My linoleum blocks came in the mail today. 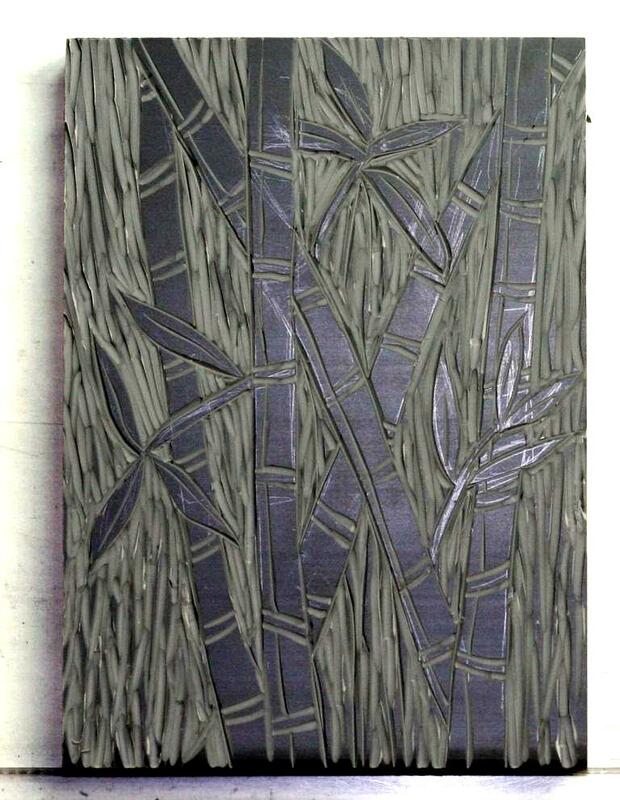 I have been eager to cut out the bamboo idea that I had last week when I couldn’t find my last one. I penciled it out based it on a little sketch I had done, and then adjusted it as I cut. Sorry about the flash sheen, though. I got a late start this afternoon and was not able to photograph it outside. I tried four different ways and the flash just bounced off of every one. If you click on it, however, the enlargement is a bit better. I upped the contrast some, so it actually looks a lot like the print will. I think I will once again make both a straight black ink print and then add some watercolor to a few. I really like the mossy green that I used before, so I probably use it and maybe something else. It is so hard to decide before I see an actual print. That will be tomorrow’s task. This will make a beautiful print! Wow! I can hardly wait to see this! Hah, I just printed them up and I’m pretty pleased. I made one to keep black and two to color. Stay tuned.